A progress report released this month on a two-year-old, local initiative to prepare more youngsters for college success revealed promising results, though education officials cautioned that California’s budget cuts threaten to hamper further gains. 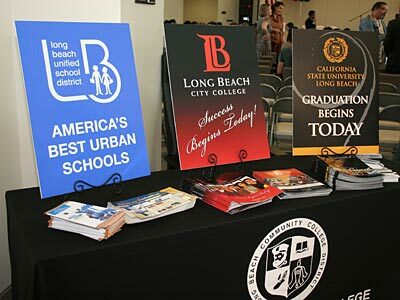 Two years ago, leaders from the Long Beach Unified School District, Long Beach City College and California State University, Long Beach signed The Long Beach College Promise, committing the three institutions to providing local students with greater opportunities to pursue, and succeed in, higher education. “While California’s fiscal crisis will make further implementation of the Long Beach College Promise difficult – and may even slow the pace of improvement – the three institutions remain determined and committed to providing greater educational opportunities for students,” stated the progress report’s cover letter, signed by LBUSD Superintendent Christopher J. Steinhauser, LBCC Superintendent-President Eloy Ortiz Oakley, and CSULB President F. King Alexander. • CSULB students from LBUSD and LBCC are more likely to persist, or remain enrolled at the university, than their counterparts from other high schools. The progress report also highlights key initiatives that the three institutions are implementing to prepare more students for success not only in college, but also in high-demand, high-paying jobs. Included in these efforts is a commitment to cover the cost of enrollment fees for every local high school graduate who enrolls directly at LBCC after graduation, beginning this year.